I was so excited to deliver and set up Tiffany and Lee’s 6 tier wedding cake to the very lovely Down Hall, just outside Hatfield Heath, the first time we have ever delivered there. This was such an amazing cake to make! 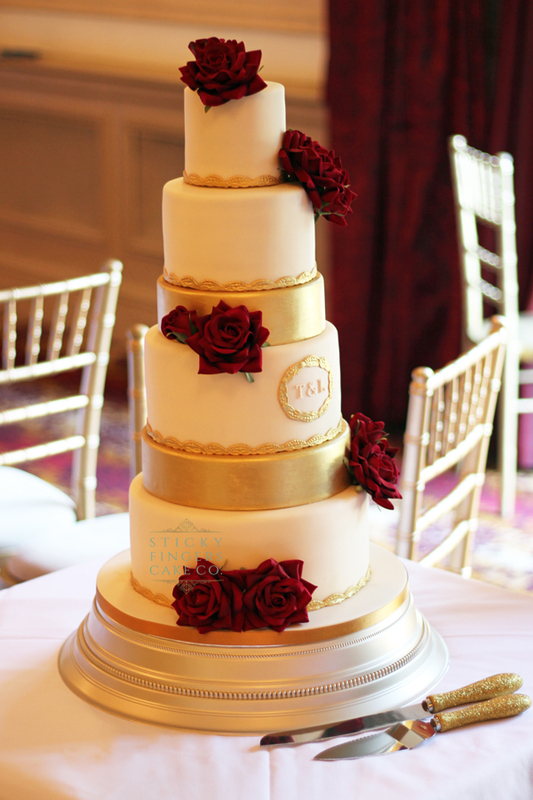 Four real tiers and two dummy tiers, painted in sparkly gold edible lustre, with gold borders and an initial plaque, decorated with dark red roses – it fitted in beautifully with Down hall’s surroundings. Their gorgeous flavours were Victoria Sponge, Rich, Dark Chocolate, Chocolate Orange plus a Salted Caramel cutting cake. Thank you for choosing Sticky Fingers Cake Co to create your wedding cake. We hope you had the best day ever!